Yes, I love music. I love rock and roll and all its antecedents and permutations. Punk, metal, classic, glam, blues, R&B, indie, heartland, roots, folk rock, country rock. Oh, and I do love jazz and classical music too. Here are some posts on those topics. Beautiful song by the protopunk band Suicide, first performed by Bruce Springsteen in 2005 and again in November 2013 at the Stand Up for Heroes concert. This post contains two embedded videos: one of his 21-minute SUFH performance, complete with bad dirty jokes, and a thank-you-to-fans video of DBD. Both great videos. Yes, I do. This was my first post to my new blog in July 2012. It contains a lot of musical memories. Two nights to rock. Two amazing concerts by Bruce and the E Street Band, expanded to 17 musicians on the Wrecking Ball tour. Nights to remember. In which I quote Mr Springsteen (why not?) and Lin Brehmer of WXRT and remember how I loved seeing my son Steve play his tenor in the Deja Vu Big Band. Better live goes for theater too. 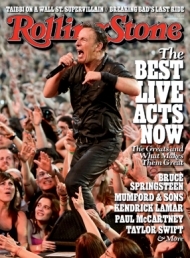 Springsteen was named the best live act of 2013 by Rolling Stone. Anyone who has seen him live and watched his clothes gradually get soaked with sweat will attest to that. The man works hard and his audience appreciates it.